Life Settlements - Why Invest in Life Settlements? 1. What are the expected returns? GIAM’s preferred strategy is to buy and to hold to maturity, physical life policies that meet certain strict criteria and that have passed rigorous due diligence. Synthetic variants of longevity investments miss many value opportunities presented by physical policies and are opaque as to fees and assumptions. The return profile and behaviour of a portfolio of life settlement policies is completely different to traditional investments. At the lowest risk entry point, to the asset class, offers “rule of thumb” returns of 500-600 bps over the equivalent tenor US treasury rate. A carefully considered walk up the risk profile path could potentially add 50-100% to this return target. This is even more attractive when you consider that the underlying credit risk of these instruments is very low. It is interesting to note however, that it is precisely this aspect of limited liquidity that shields this asset from taking on the correlations of listed and other rapid transactional markets. If you are comfortable with these aspects the asset class is worth considering. So when will I see returns you ask? The short answer is that normally the bulk of returns would be expected in the second and third quartiles of the average mortality curve of the pool of insured lives. However, a number of factors can skew this outcome particularly if there is a big variation in policy size within the portfolio or if the portfolio is small. It is normally unusual to see significant maturities in the first few years of a newly originated portfolio. The certainty for many newly established portfolios is an initial long period of small negative return, as a result of continued premium payments and initial purchase of policies. Investors in smaller portfolios, say less than 2000 lives, should also expect lumpy returns simply for the reasons of probability and chance in small samples. An initial negative return profile similarly observed in investments like infrastructure or a “Land Bank”. In fact, it has often been shown to be a “Red Flag” for smaller funds when published returns indicate regular and invariable positive returns from the very outset of a fund’s establishment. This investment is rewarding to those who show patience, dedicated capital, and the openness to recognise asset managers who take a conservative approach to stable ongoing returns. 2. What is the Risk Reward Profile? Although the market is considered low risk an investor can unwittingly make high risk decisions, at a policy level, that can impact their returns. For example, an investor may purchase a tertiary portfolio for far less than the original purchase price with the expectation of above average returns. However, this portfolio may exhibit poor mortality experience. This may be due to poorly executed buying decisions and due diligence or flawed life expectancy estimates when it was originally constructed. (If something is cheap there may well be a good reason for that). As the popularity of the asset grows some investors are demanding a quick return profile with a high level of liquidity. This is typical with the marketing of retail investment schemes. However, this asset requires a patient investor with the ability and will to hold to maturity. Investors should commit to at least 8 to 10-year horizon in order to realise respectable gross risk adjusted return. As mentioned earlier, insurance based instruments perform to in a manner totally unrelated to traditional investments. The returns both predicted and realised, are driven by the probability and then the eventual timing of the insured risk occurring. 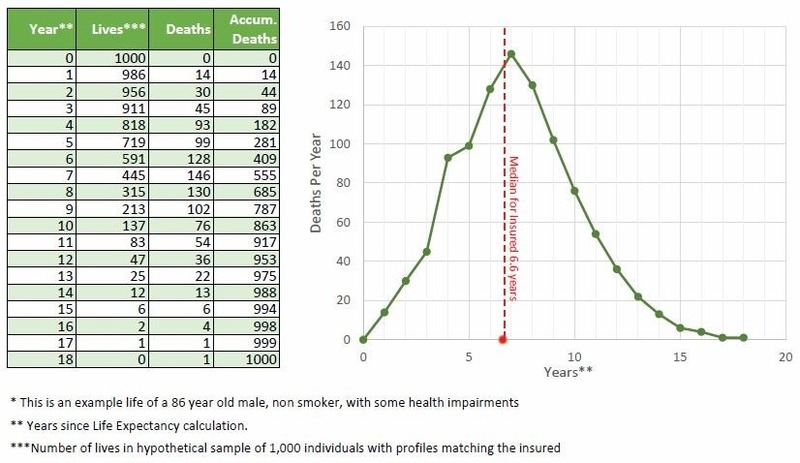 In the case of secondary life insurance contracts, the returns will normally occur along a predicted mortality curve based on a set of data of historical experience. This data is accumulated and refreshed regularly by underwriters and is derived from data from thousands of similar cases. Contained within this resulting data will be a point that the industry calls “life expectancy” but in reality, is only the median point (the 50th Percentile). However, what the graph clearly shows is a period of time (which may be several years) where the event is statistically “most likely”. This is still not a guarantee. Here below is a sample curve from one case. Obviously, a portfolio will be made up of many cases (the more the better) and the average shape of the portfolio’s curve will be driven by many factors. These include (to name a few) the variability of case size, the variability in insured characteristics, the variability of median predicted tenor. The actual insured event will occur randomly along the line in a manner idiosyncratic to that case. A portfolio is constructed, valued and returns are forecast using the predicted mortality data. In a portfolio, the narrower the band of projected returns, the more certainty there is that those events will occur in that time frame. Conversely, a portfolio with a wide predicted mortality spread would be expected to have more volatility of returns. To mitigate against volatility in returns, the investor needs to be aware that as the size of a portfolio (the number of cases) increases so does the confidence in the statistical predictions. Buying the best fit policy types is particularly crucial from a risk management standpoint. The ability to purchase a large pool of appropriately diversified lives will hinge directly on the amount of invested capital and the number of lives in the portfolio. The smaller the portfolio the more difficult it is for the investment to closely follow actuarial predictions. Small portfolios exhibit lumpy returns. There is a strong requirement for careful portfolio construction and to be resolute in your asset selection criteria and implementation. Constructing a portfolio of life settlements assets is both an art and a science. In fact, every new life policy, you pick up to analyse, will potentially have features and data idiosyncratic to that case alone even when potentially comparing different policies on the same insured life and issued by the same insurance company. A skilled asset manager can look through masses of data and policy contract information in an effort to recognise and optimise crucial features to the investors benefit. 3. What is the Market Outlook? 4. How is the market regulated? 5. What are the volatility risks? 6. What are the asset quality features? Like any investment, you want to be sure you get paid in due course. This asset exhibits outstanding credit quality. Not only does the U.S. life insurance industry exhibit an unblemished record with respect to payment of valid death benefit claims. This risk is hedged through purchasing policies issued by a spread of the most financially strong insurance companies. US life policies boast underlying credit quality higher than most bank issued bonds. Death benefits are paid out of legally distinct statutory reserves that are closely regulated. This was proven when claims were still paid even during the depths of the global financial crisis. This information is intended for qualifying investors only and was correct at the time of preparation. It has been prepared to provide general information only and should not be considered as a “securities recommendation” or an “invitation to invest” in any jurisdiction. Potential investors should consider the relevance of this information to their particular circumstances. Before proceeding investors must obtain the prospectus and take their own legal and taxation advice. If you acquire or hold one of our products we will receive fees and other benefits as disclosed in the prospectus and relevant offering documents. GI Asset Management Limited (GIAM), is a specialised asset manager within the insurance linked securities market. We are experts in actively managing large and diversified portfolios of US life insurance policies or more commonly referred to as Life Settlements. Over more than 10 years we have had gained significant experience in structuring appropriate solutions for larger non-USA domiciled institutional clients. We have the experience and flexibility to lead our investors toward finding their real value and economic risk/reward frontier in this ever evolving asset class.